"41HS825, 2003.08.525, Burial 3, Vessel 20" by Timothy K. Perttula and Robert Z. Selden Jr.
DECORATION (INCLUDING MOTIF AND ELEMENTS WHEN APPARENT): The rim panel has an engraved slanting scroll motif that is repeated four times around the vessel. Each slanting scroll contains hatched hooked arm elements that conjoin, or in one instance has ticked lines instead of hatched lines; the ticking continues onto the scroll line. The scroll motifs are divided by two sets of narrow arcing lines with hatching. The upper and lower scroll fill zones have narrow arcing lines with hatching. 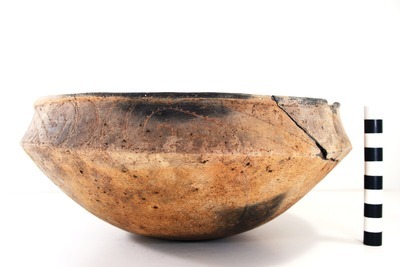 Taylor Engraved carinated bowl, Burial 3, Vessel No. 20, Patton site.